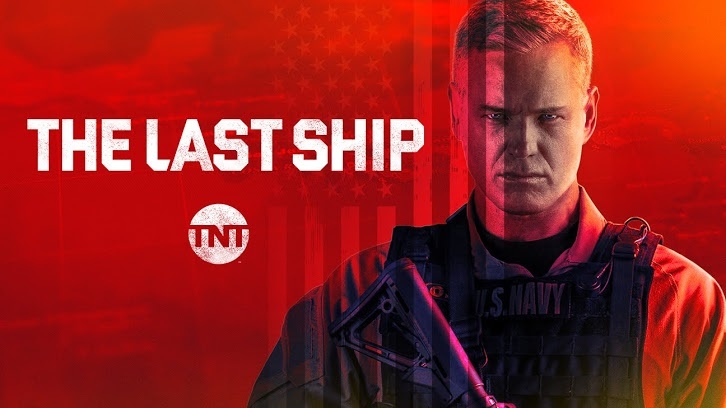 The Last Ship - Casus Belli - Review - "We're Going To Fix This, Like We Always Do"
Three years after famine threatened the world, the scars of plague and hunger are fading away. The phrase "back to normal" is what we immediately think. But does everyone want the world to go back to the way it was? Was life that much better for everyone? Is it even possible to return to the way things were? This is a larger issue that the show has dealt with, with Tom Chandler and his crew fighting to preserve humanity in the face of barbaric opposition. But a violent world doesn't come to peace through something as simple as a cure or a loaf of bread. Two celebrations are the backdrop for most of "Casus Belli". Two birthday parties basically. The arrival of a new Navy fleet and a black-tie gala to recognize the special day of a controversial Latin American president. Both are meant to commemorate stability. How these events collide sets the stage for a fierce final season. Before the party gets started, we're treated to a glimpse of what has happened to these beloved characters in the last three years. Master Chief Jeter now works at fleet command, along with Granderson (who is in a happy new relationship) and Meylan (now Admiral Meylan). They are overseeing an exciting occasion: the arrival of the new US Navy fleet. I definitely got a proud lump in my throat when the new ships checked in. Slattery, also an Admiral now, leads the fleet. Garnett also has been promoted to commander of her own ship. As for the man, the myth, the legend Tom Chandler, he now teaches at the Naval Academy, reminding the next generation of what it means to protect their country. And how putting on the uniform means setting aside personal impulses. "People let their fear, their honor, their interest cloud their judgment." Chandler, however, has never been in a more peaceful place. He is dating Sasha and calls her up for consolation over being an empty nester, as his children have moved out. Sasha says maybe they can all get together at Christmas. It's not just a lovely "Sasha and Tom are together now" moment, but it's also very normal. The stark contrast to where he's at now and where he's come from is further on display when Chandler visits the Nathan James. It is a museum now. A museum that goes on dolphin cruises. It's hard to describe what it feels like to watch Chandler examining the exhibits, the reconstruction of Dr. Scott's lab, the cardboard cutout of himself, his uniform framed and hung behind glass on the wall...what must it feel like to any soldier who sees years of battle reduced to simple placards identifying mementos. A couple asks Chandler for a photo. He agrees with a friendly smile and realizes they want a photo with the cardboard version of him. It's a brief scene with so much to say. How quickly life moves on and forgets what things really look like. Chandler reunites with a bevy of our favorite characters, including Slattery, Garnett, and Gator. The latter has retired and has a two year old son now. When Chandler walks in on them talking in the dining hall, they don't see him at first. And he just watches them, proud and happy and a little overcome. They are still his crew, and he's grateful they made it through to be here. Kara enters, and we find out that she's a Commander now, temporarily in charge of the Nathan James for the fleet festivities. As many fans feared after the trailer, she and Danny are at the very least estranged. He is off on a mission with Sasha's Squad, and Kara says Chandler would know more than she does. "He's doing what makes him happy or at least what keeps him sane." Apparently this is one warrior who can't adjust to peace. Sasha is currently south of the equator, along with Wolf and Azima, as well as Danny. A contact gets them into the presidential birthday gala in Panama City, and their mysterious purposes are gradually revealed. Although not before a very suave stranger named Hector Martinez goes out of his way to talk with Sasha. When El Presidente pulls Sasha aside for a chit chat, she waits until he pauses ogling her to reveal that her team has gotten past all his security and shows him "three ways to kill you". Delightfully shiver-inducing. El Presidente should be dazzled. He should be begging Sasha to make good on her offer to improve his security. But the man baby only sees that he has been embarrassed, that he has been caught showing weakness. Even Sasha's plea they could train his men in secret is met with a sneer. The next day they find out he has been assassinated. Simultaneously, the fleet celebration is attacked from the air, after the command center suddenly loses contact with their satellites. There is no advance warning. The assault is fast and bloody, with civilians and military personnel alike caught in its path. They try to fight back. Burk and Slattery are able to commandeer anti-aircraft guns. Chandler goes in search of a Stinger. Out at sea, Commander Kara makes the tough call to not head towards shore to help. They wouldn't be able to make a big enough difference to justify risking the lives of those on the ship, including many civilians, and they have to be ready for the battles to come. Amidst the bloodbath occurring aboard the fleet, a couple casualties strike particularly hard. Garnett is strafed with bullets while making an ammunition run. Doc Rios hurries over to help her. "We're going to fix this like we always do", he promises. He is killed while kneeling beside her. And though Slattery drags Garnett out of the line of fire, she dies in his arms moments later. The attacking planes eventually retreat, leaving behind the smoldering ruins of the fleet. The Nathan James is once again the last ship. In Panama, Hector Martinez broadcasts a message blaming Sasha's team for killing El Presidente and declaring that the US has been attacked in retaliation. He says they won't be stopping there either. When Sasha's team gets this news, they quickly figure out they are trapped. Danny suggests they don't try to get home though. They should go further south, collect intelligence and supplies, anything they can use to get an advantage.There's more to the suggestion though. There's something colder and darker about Danny, and we can expect whatever demons he's wrestling to come out to play. The Nathan James won't be far behind. Slattery and Burk decide to return to the ship and head south to find their enemies, with Chandler staying behind for now to assist fleet command. It's especially hard to watch Slattery dealing with this tragedy. It is no surprise that he can't go after the people who did this fast enough. Everything he's lost and now one of his closest friends and his entire fleet. "It happened on my watch." He's pure anger, and that adrenaline will fuel him for a while. "You know where to start," Chandler tells Slattery, "but if I don't hear from you soon, I'm going to come looking for you." Chandler and other survivors stand at attention as taps play. He is surrounded by the smoke of burning ships and stained by the blood of teammates. It's impossible to not feel like you've been punched in the stomach. Thus the season premiere concludes with a full-fledged war about to erupt and with the crew once again divided. There will be reunions ahead. But there will also be more danger than ever before. The stakes have never been higher, and all bets are off.